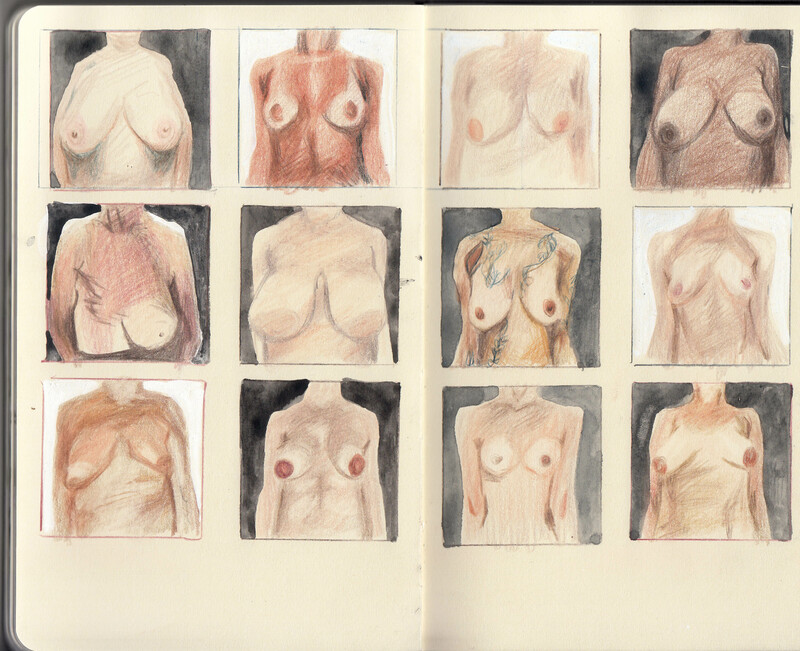 Laura Dodsworth has inspired this sketchbook spread – click here to see Laura’s work in a Guardian article. After a friend sent me a link to this article, I thought I’d like to draw breasts, you know, how you do. I like Laura Dodsworth’s work here because it is important; we are all (men and women) constantly bombarded with airbrushed images of perfect bodies and it is easy to loose sight of the reality. I remember, aged 19, when first attending a gym in Italy, that I was quite surprised by the difference in women’s bodies. I was shocked because in English gyms the changing rooms were not communal. I tried not to look too much, but it was fascinating to realise that I was just like other female humans and not an imperfect reject of a woman! And of course, as an artist there are life drawing classes, I’ve seen plenty of naked people of a range of shapes and sizes and yet still compare myself to the unrealistic images we see in films. It is normal, I guess – but not good for us. So I enjoyed looking long enough at these sets of breasts to draw them, which forced me to really look, and take in that breasts are soooo different. Another reason Dodsworth’s work stands out is for including the women’s opinions of their own breasts. Long having had issues with my own body-image, especially my breasts, it has been a little bit of a cathartic day, drawing real breasts – and well, they are rather good things to draw. I’d love it if anyone would like to comment on the issue of body image – or the artwork. I am still in full love affair with coloured pencils. I don’t know what anyone else thinks but this affair has a long way to run yet… I am also thinking of putting together a sister blog, where I write on ‘issues’ that I have thoughts on, such as: parenting, higher education Fine Art courses, my experience of teaching on BTEC, er.. a conversation I heard on the bus, or politics, science – I don’t know… but the only proviso being that I also have to illustrate it! (Well, if no one is going to commission me – I may as well commission myself!). You hit the nail on the head — even though we are bombarded with images depicting the “ideal” men and women, the reality is that none of us live up to that standard. (And yes, that causes problems) Great work, both in technique and scope, to address this issue. It would be great to see an appreciation of the various shapes and sizes of all men in the arts. I have not seen that yet. But, perhaps things will change.